Belgen zijn georganiseerd – this means they’re organized and do not like chaos. In practice this means they cannot handle change in routine. Even a little disruption in the normal schedule and Belgians find themselves lost. A few months ago the road was being worked on at the train station and the busses were being re-routed to other temporary stops around the station. The poor Belgians were so put out. Even though the road was closed off with really big and obvious red and white barriers with flashing orange lights on top, the Belgians would still congregate at these bus stops. They stood there and eyeballed the busses as they rode past the barriers of the road closure, some shrugging in disbelief and others grumbling to whoever would listen. Not one of them would look about to see if there was a notice or some sort of alternative or instruction. There was instruction, by the way, in the form of posters stuck up at the disused bus stops giving detailed instructions on where to find the temporary bus stops so you could catch the bus you needed and exactly how long this situation would continue. The absolute disbelief that the routine of catching the bus has changed – the unacceptance of even the slightest chaos – to the point of ignoring massive barriers in the road and the expectance that the bus will magically hop over these barriers to pick them up. The absolute organization of the bus company by placing notices up to inform it’s clients where the new temporary bus stops are so that they won’t be inconvenienced and the expected time period of the works – which were completed exactly, EXACTLY on time. No rubble left lying around, no sign that the road had been worked on except for a brand new road. This love of organization impacts directly on becoming a Belgian too. If you move to Belgium, be prepared. You will have to take mandatory courses. Even if you are a Belgian citizen and you’ve been out of the country for more than five years, you have to do these courses. The Belgian Government says so and if you don’t do the courses you’re in for a heavy fine. I have found this hard, good, frustrating, pleasing and highly recommended. The first of these courses is the Inburgerings course. These lessons inform you about your rights as a citizen, where to go for help on various topics and organizations in Belgium and how to use certain social services, such as schooling, and how they operate. The second of these courses is Nederland lessons. Why? Because you cannot function in Belgium at an appropriate level with at least a basic understanding of the language which glues the Belgian people together – Belgian Nederlands. This course is also paid for by the Belgian government. The only thing I did have to pay for in these courses was one text book – the Nederland language course text book and that was ridiculously inexpensive. This one’s easy. I like routine and can frown and shrug at busses with the best of them. When my day goes wrong in the early morning, when I forget to put sugar in my coffee or brush my hair before I’ve done my teeth, the day’s a write-off because that delicate routine I love and do every morning has been buggered up. Or at least that’s how I feel. To me that small misstep is utter chaos. The organization thing I’ll have to work on. 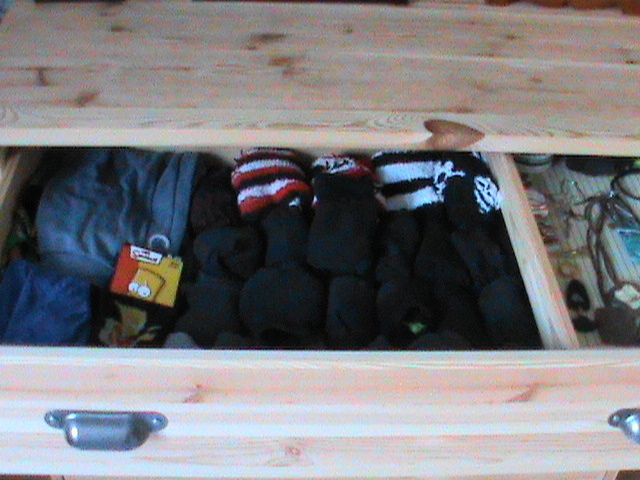 My sock & undie drawer is, well, not organized. 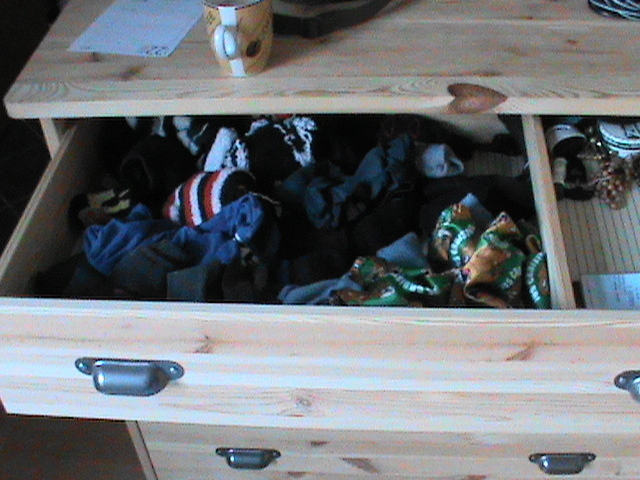 The only organization in that drawer is that it contains mostly socks & underwear. To be Belgian, I am going to have to organize that drawer – easy. You will notice the underwear is to the left, divided into winter and summer wear and closest to the bathroom door as this is the first to be donned. The colourful socks are at the back as required by conclusion by the previous post because colourful items are to be worn sparingly. The socks in the foreground are ordered by shade, lightest to darkest. The items in the utility drawer are items used daily and placed in pockets of the final outfit. …and keeping it organized – haha. This entry was posted in Belgium, Expat, Uncategorized and tagged Belg, Belgian, Belgium, Chaos, Expat, Experiences, Organization. Bookmark the permalink.